Click here to register for the 2019 Spring Banquet! Shaun F.O’Malley, former Chairman of Price Waterhouse, died on February 25 of metastatic melanoma, surrounded by family in Philadelphia. The fifth of eight children of Inez Fitzpatrick O’Malley and W. Gresham O’Malley Jr., he attended Waldron Mercy Academy and the Canterbury School, and he earned his accounting degree at the University of Pennsylvania Wharton School. At Penn, he was a Brother and President of Zeta Psi Fraternity and was active in the Penn Players where he was a member of the Chorus in “The King and I” and “Brigadoon.” O’Malley served in the United States Army Ordinance Corps in Mainz, Germany in 1953 and 1954; following his service with the 1st Guided Missile Battalion, he returned to Penn under the GI Bill as a Korean Era veteran. O’Malley joined the accounting, tax, and consulting firm of Price Waterhouse in 1959 in Philadelphia, and worked in the New York and Japan offices prior to being elected US Firm Chairman in 1988. He served as US Chairman from 1988 until 1995 and was also World Firm Co-Chairman in 1994 and 1995. For 36 years, he served clients and the firm selflessly, and was known as the quintessential client service partner. A man of great integrity and foresight, he led Price Waterhouse during an era of increasing consolidation and massive technological change and he fostered greater global integration as the firm moved into new markets in emerging economies. O’Malley was also a leader in promoting greater auditor accountability and, at the request of the SEC and Public Oversight Board, served as Chairman of the Committee on Audit Effectiveness; following publication of that Committee’s findings, he testified before the Senate Finance Committee during deliberations that led to the Sarbanes-Oxley law. He was a member of many boards and audit committees, including The Federal Home Loan Mortgage Corporation (Freddie Mac), Monell Chemical Senses Center, Horace Mann Educators Group, Philadelphia Insurance Company, The Philadelphia Contributionship, The Philadelphia Beltline Railroad, and The Finance Company of Pennsylvania. In addition, he served on the boards and audit committees of many organizations, including The Curtis Institute of Music, The University of Pennsylvania, The University of Pennsylvania Health System, The Wharton School, The Chestnut Hill College, The Springside School, The Archdiocese of Philadelphia Finance Committee, The Canterbury School, and The Committee of Seventy. He was also a member of many social clubs and organizations, including the Philadelphia Club, the Rabbit, The Brook (NY), the Philadelphia Cricket Club, and Sunnybrook Golf Club. A man with diverse interests and exceptional communications skills, he could converse with anyone, anywhere, on any subject. His hobbies included tennis, reading, and time at the Avalon beach with his family. He greatly enjoyed classical music and was a subscriber to the Philadelphia Orchestra for many years. He was a fearsome competitor in any game or competition, most especially softball, tennis, and in his later years, Boggle, which he played with his grandchildren. He was a devout member of the Catholic Church. A private funeral was held on Saturday, February 28 in Philadelphia. A Memorial will be held on April 25, 2015 at 1:00 p.m. at Our Mother of Consolation Church in Chestnut Hill. In lieu of flowers, a contribution in Shaun’s memory can be made to Curtis Institute of Music, 1726 Locust Street, Philadelphia, PA 19103; or to support Dr. Lynn Schuchter and the melanoma program at the Abramson Cancer Center of the University of Pennsylvania, Penn Medicine Development, Att: Laura Ferraiolo, 3535 Market St, Ste 750, Philadelphia, PA 19104 (kindly make your checks payable to Trustees of the University of Pennsylvania). I live and work at the US Embassy in Afghanistan. Mini-reunion from the Class of 1972. Pictured l-r are Ken Swain, Edgar Bates and Page Stull. I am currently running my own boutique executive search firm in Beijing China. My son, Schuyler graduated from Penn in May 2008 and is currently unemployed and living in Philly - these are difficult times. My daughter Alexandra is currently a sophomore at Wake Forest University. Michael Scullin has been appointed Honorary Consul of France, acting as the official representative of the French Republic in Philadelphia. He continues as Counsel to the law firm of Monteverde, McAlee & Hurd, in international, commercial and nonprofit matters. He is also a consultant to firms and nonprofit organizations on global expansion and teaches international law as an Adjunct Professor at Temple University. I am working for Fleet Specialists. My wife, Liz, and I have a 9-year-old son, Henry IV. Joe Sims ('40) has moved into Devon Manor where he is enjoying being near his family, son Dave ('76) and daughter Anne Sims. He gets back to campus for Penn Football and has attended Homecoming and Spring Banquet. I am still climbing mountains, skiing, kayaking and competing in cross country ski races, mountain running races, swim meets and triathlons. In other words, I am blessed with good health and am active. I haven't eaten any meat in 29 years except fish, which is a diet I recommend. I was divorced several years ago and as bad as that was, I have recovered and am having a great time as single person. After Penn I spent a couple of years as a ski bum, and then went to law school. I practice law solo, and will continue for a few more years. My three children are adults and doing well. I have four grandchildren. 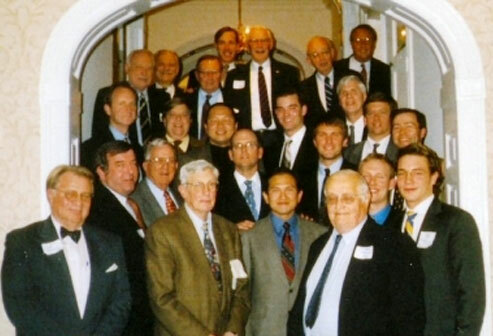 I would enjoy hearing from my friends from Zeta Psi with whom I lost contact long ago. I note belatedly that the Directory does not reflect the death almost three years ago of my old friend Tom Vietor '66, who was my freshman roommate and who convinced me to become a Zete. I know many of us will remember him fondly. Posted below is his obituary from the NY Times. VIETOR--Thomas Frederick III, 66 of Katonah, NY died October 1st of cancer. The son of Carolyn Raymond and Thomas F. Vietor Jr. Tom was born and raised in Manhattan, graduated from St. Paul's School, the University of Pennsylvania and served in the Air National Guard. He was a member of the New York Yacht Club and a former Board Member of the Orchestra of St. Luke's. He spent his career at Johnson & Higgins and then Marsh. He retired as Chairman of Marsh FINPRO Global. He is survived by his wife Jeanne K. Windbiel, son Tommy Vietor of Washington, DC, daughter Taylor Vietor, stepson John Cunningham, sister, the Reverend Julie (Vietor) Kelsey of Branford, CT and numerous nieces and nephews. A service will be held at St. Matthew's Church in Bedford, NY on Thursday, October 7th at 11:00am. In lieu of flowers donations may be made in his memory to: GU Oncology Research Fund, Dr. David Nanus, 1305 York Ave., Box 403, New York, NY 10021. My youngest, Benjamin Michael, will graduate from high school on June 28, then will head to University in the US and study Contemporary Music. Both daughters, Sarah and Jessica, are living in NYC. Sarah is a PhD candidate in History candidate at Columbia, and Jessica a young assistant manager at Avon. Karen, my wife of 30 years, is aging beautifully and gracefully. 2017 © Philadelphia Association of Zeta Psi.